A man found a pregnancy test kit his ex left behind. He used it for a lark, to discover he was "pregnant". 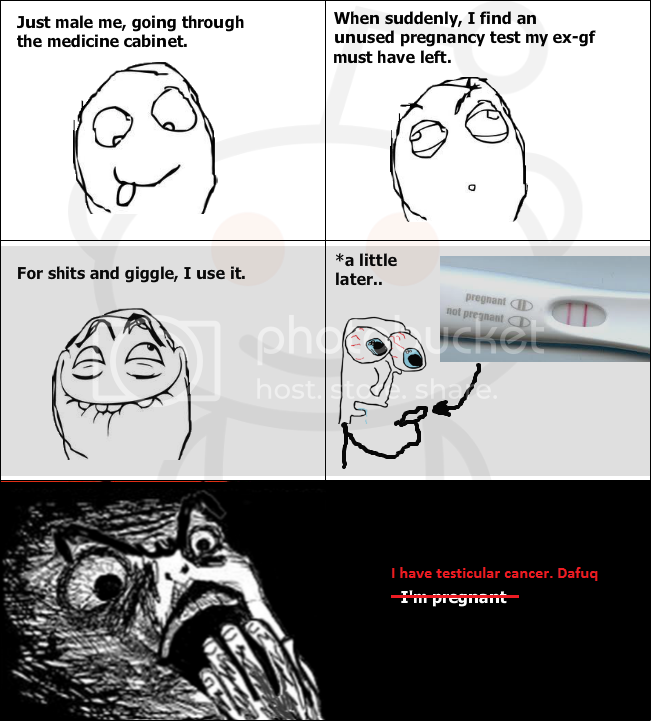 He told his friend, who turned it into a Rage Comic (original pic below has been modified by me *in red*) for other Redditors to enjoy. In >3 days, 1300 comments were posted to tell the guy to get checked for testicular cancer. So he did. And found out he got a nasty surprise in his right nut. Apparently pregnancy tests measure for beta human chorionic gonadotropin, which is the sign for possible pregnancy. What I want to know is, what other forms of cancer does it recognize?